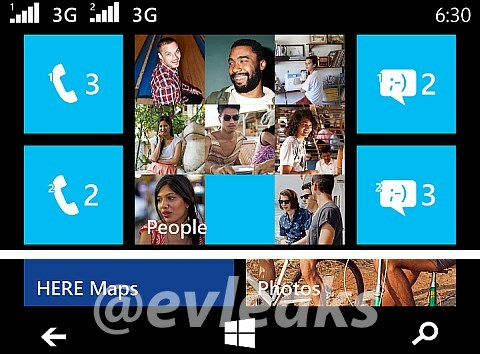 Earlier this week, the leading leaker in the industry – @evleaks – has revealed an interesting screenshot of a Start Screen on Windows Phone 8 that provides the first glimpse on how dual-SIM capability works on the OS. Said to come from Nokia Moneypenny which is rumoured to be a dual-SIM device that runs on Windows Phone Blue / WP 8.1, the shot showed two cellular signal indicator on the top left of the screen. Both of the indicators are also labelled 3G which could mean that the device might be able to support active 3G in both SIM card slot. In addition to that, the shot also shows numbered Phone and Message icon on the screen’s Live Tiles which most probably refers to the two individual SIM cards inside the device. At the bottom of the screenshot, there is also a set of Windows Phone virtual control button that have been leaked previously as one of the new features for Windows Phone Blue. Since dual-SIM phones are very popular in emerging markets including right here in Malaysia, a Nokia Lumia device with such functionality might able to push Windows Phone to even more users especially among budget-oriented users which are the main customers of dual-SIM devices. Of course, it is only official until Nokia reveal this device themselves but given @evleaks excellent track record, this is indeed a good initial glimpse into Windows Phone future.